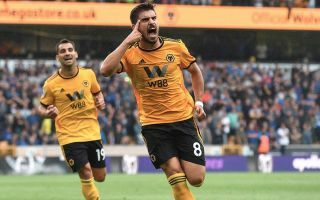 Wolves sensation Ruben Neves could be the subject of a January transfer saga as rivals Manchester United and Manchester City compete to land the midfielder. According to a report from the SunSport, who state that Neves is rated at £60m, United are willing to go head to head with their Manchester rivals City who have held a long standing interest in the midfielder. Manchester United manager could lure Neves to Old Trafford, with the pair sharing the same agent – Jorge Mendes. Neves could also be more interested in a move to United as opposed to City considering that Mourinho is one of the biggest names ever to come out of Portuguese football. United have struggled to make a good start to the new Premier League season – with losses against Brighton and Tottenham piling pressure on Mourinho to turn around results or risk facing the sack. It is mentioned by The Sun that both sides weren’t previously considering making the signing in January but City losing out to Chelsea on midfield target Jorginho this summer has accelerated Pep Guardiola’s plans to find a long-term replacement for Brazilian star Fernandinho. The Neves transfer saga will see the Manchester clubs once again go to battle for a marquee signing in the January transfer window, after both sides contested for Alexis Sanchez’s signature last January. Sanchez decided to join United and City will be looking to settle the score and not lose out to on such an important target to their rivals. Neves has only been at Wolves for just over a year after the golden-boy joined from boyhood club Porto for a fee reported to be £15.8m according to BBC Sport. The signing of Neves would most definitely improve either side’s chances on lifting the Premier League trophy this season.